The first wave of family spring break has come to an end, but students from major cities including New York, Los Angeles, Chicago, and Washington, D.C. are getting ready for their recesses at the end of April. 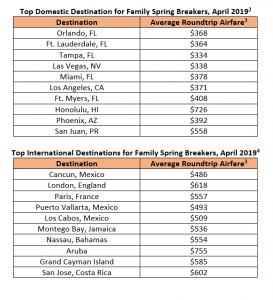 CheapOair®, an online travel agency and leading provider of cheap flights, has analyzed the latest travel trends to determine the top destinations for elementary, middle, and high school families with spring break in April1. 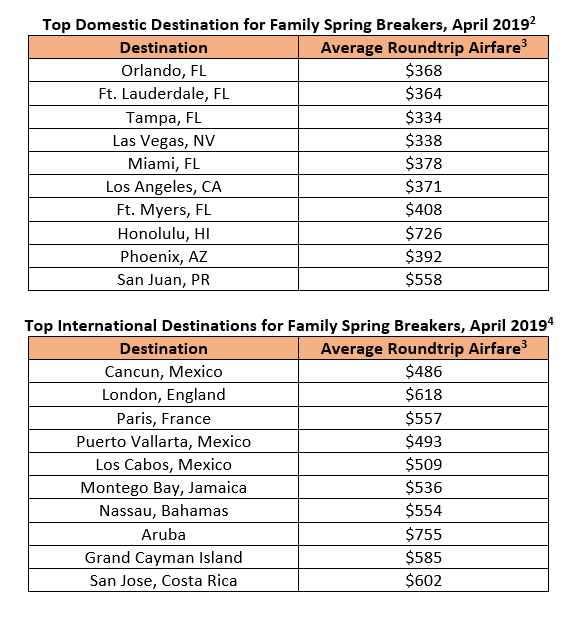 Florida continues to dominate this year’s domestic travel list for family spring breakers with Orlando, Ft. Lauderdale, and Tampa claiming the first three spots. Miami and Fort Myers also made it into the top ten. Internationally, Mexico and the Caribbean hold a strong presence, pushing out the European destinations that were popular with families during the March spring break period. In April, average domestic airfare this year is $423 while international airfare is averaging around $570. The cheapest domestic destination is Tampa, FL with an airfare of $334. Internationally, Cancun is the cheapest of the international destinations with an average airfare of $486. By consistently monitoring travel trends, CheapOair’s mission is to educate and aid consumers and travel professionals in both planning their travel accommodations and staying current on the most popular destinations. CheapOair is an online travel agency that specializes in providing cheap flights and great last-minute flight deals for travelers worldwide. Consumers can book online, on mobile apps for iOS and Android, by phone (1-800-566-2345) or live chat. 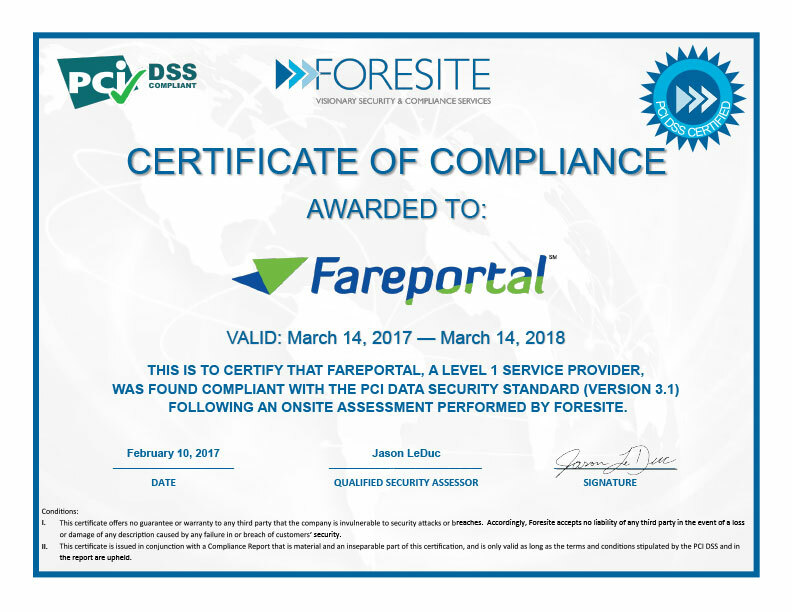 Part of Fareportal’s family of travel brands, CheapOair bridges the gap between an online travel agency and a traditional agency with certified travel agents available 24/7 to help find discount flight tickets to global destinations on over 450 airlines, a million hotels, and 100s of car rental companies. Follow CheapOair on Facebook, Twitter, Instagram , and Pinterest to learn how to travel the world for less. 1Family spring break data for March 2019 released on March 6, 2019. 2 Based on passenger groups traveling domestically in the US departing 4/12/19 – 4/16/19 or 4/19/19 – 4/23/19 and returning 4/17/19 – 4/21/19 or 4/24/19 – 4/28/19. 3 Based on average roundtrip airfare departing from US gateways departing 4/12/19 – 4/16/19 or 4/19/19 – 4/23/19 and returning 4/17/19 – 4/21/19 or 4/24/19 – 4/28/19. 4 Based on passenger groups traveling internationally from the US departing 4/12/19 – 4/16/19 or 4/19/19 – 4/23/19 and returning 4/17/19 – 4/21/19 or 4/24/19 – 4/28/19.